The Mobile Arts Platform (MAP) is a Bay Area artmaking and curatorial team founded in 2009 by Peter Foucualt and Chris Treggiari with the goal of creating mobile exhibition structures that engage the public. MAP creates an autonomous exhibition space, an artistic research lab where a cross pollination of mediums and genres can occur, be accessible to the public, and create strong bonds with partner communities. MAP events include video screenings, visual art installations, performance art, live music, interactive artworks, and culinary art. In essence, we build a temporary, creative microcosm where community and creativity can intersect and flourish. In a world where we are becoming more insular with advanced technologies our events hope to bring residents together through positive interactions with neighbors and their neighborhood. In 2010, MAP received a grant through the City Of San Jose’s Office of Cultural Affairs Public Art Program to create an exhibition for the ZER01 San Jose Art and Technology Festival which featured a group show with works by ZER01 artists, interactive robotic and sound pieces. In this event, we also collaborated with youth programs at the Washington Youth Center in San Jose to create a large-scale mural that was presented as part of our overall installation. Each of these events is unique and provides each partner community with a platform to spotlight their local artists. In July 2011, MAP created an interactive installation at the Precita Eyes Urban Youth Festival, featuring a stencil poster making station and custom stencils by James Gregg, a “Yes, We Can___” positive picketing activity, live mural painting by Bay Area mural veteran Miranda Bergman, a street art documentary by MAP artists Foucault and Treggiari with video artist John Urquhart, and a crowd-sourced mural slideshow. In April 2011, MAP set up at the Cherry Blossom Festival in the Japantown neighborhood and engaged the community through an interactive and contemporary take on the art of Haiku poetry, Origami, the creation of tea bowls and an exploration of the traditional Japanese tea ceremony, as well as featuring artworks by local Japanese artists. Working with the Potrero Hill Neighborhood Association in October 2010, MAP created an enriching space at the Potrero Hill Festival where members of the diverse socioeconomic groups that make up the Potrero community were able to come together to spotlight and celebrate their local creative talents through a youth talent show featuring live music and dance, and live spoken word performances by Potrero based poets (youth and adult). Additional 2010-11 MAP events have taken place at Root Division, SOMArts, Million Fishes Gallery in San Francisco, and Oakland Art Murmur. In 2012 MAP received a grant from the city of Oakland’s Cultural Funding Program to create a series of installations at Oakland Art Murmur’s “First Friday” art walks. MAP also received a grant from The Seattle Center Foundation to create an installation for the Next50 celebrating the 50th Anniversary of the Seattle Worlds Fair. In addition, MAP set up interactive installations and static programming at the Torrance Art Museum (Los Angeles, CA). MAP was also featured in the American Association of Museums “Trends Watch” 2012 report. In collaboration with Building Bridges MAP has received a grant in 2012 from US Bank to design the “Building Bridges Post Station”, an interactive mail art installation, which appeared at Oakland Art Murmur and the Seattle Next50. 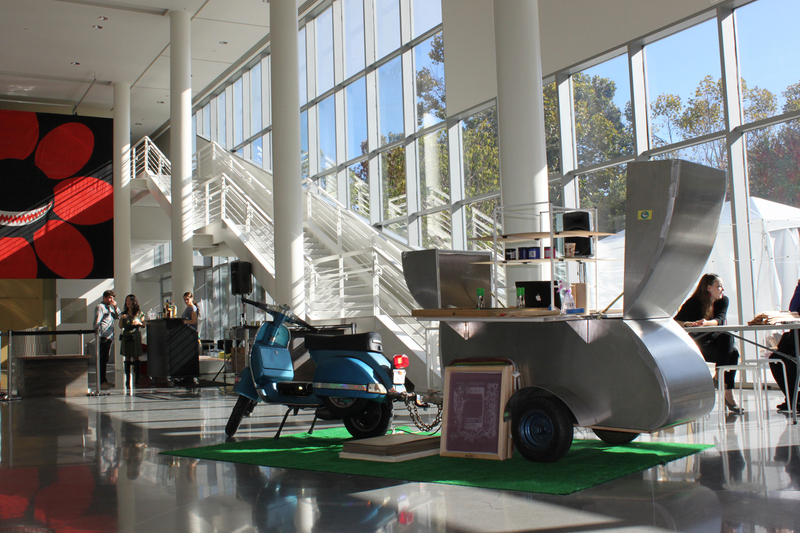 In 2013 MAP set up installations at Yerba Buena Center for the Arts (San Francisco, CA) Marine Contemporary (Santa Monica), ProArts (Oakland, CA), and The San Francisco Art Institute. MAP also received a Zellerbach Family Foundation grant to create programming in collaboration with Barbary Coast Amusements and the Bayview Opera House. In 2014 MAP was invited by the Getty Museum to undertake a summer residency that included five on-site installations at the Getty Center and a sixth on-site installation at the Getty Villa. In addition MAP partnered with Art Division in Los Angeles to create youth printmaking workshops and a pop-up installation at their gallery space in downtown LA. Additional 2014 MAP shows included an installation in “The Watchmen” exhibition at the Torrance Art Museum (Los Angeles, CA) and installations at Alter Space Gallery (San Francisco, CA), The Southern Graphics Council (Oakland, CA) and the Oakland Zoo. In 2015 MAP created satellite programming and a temporary installation at the Oakland Museum of California as part of their “Who is Oakland” exhibition. Their project is called “Eyes on Oakland” and is a collaboration between MAP and the Center for Investigative Reporting (CIR). This project combines social practice with journalistic investigation to explore the role surveillance plays in the lives of Oakland residents. This project was funded in part through a grant from the Puffin Foundation. In 2015 MAP received a generous grant from the Palo Alto Arts Commission for the project “What’s the Big Idea?, a mobile project that engages residents and gathers their thoughts on how artists might make Palo Alto a more vibrant or livable city. In 2016 MAP created Oakland Re:Construction, a project that explored the shifting dynamic in Oakland neighborhoods and displacement of long term residents. This project was included in Oakland I Want You to Know, an exhibition at the Oakland Museum of California. MAP also received a Wattis Family Foundation grant to collaborate with The Great Wall of Oakland (GWO) to create mobile video programming that directly engages Oakland residents. (J.T) What does it mean to create a Mobile Arts Platform? (P.F) By creating a mobile arts platform we can reach the public directly by coming to them. Rather than having to travel to a gallery or museum, people can experience and participate in both the viewing and creation of artwork within their own community. It allows us to partner with institutions and non-profits and develop programming that can take place either at their location or at a space off-site to create a bridge between their organization and the community. Also, not being tied into a brick and mortar space allows us to modify our structures each time we install them to meet the needs and challenges of each event. (J.T) Where did this concept for these structures come from? (P.F) Originally the concept for these structures evolved out of combining “Fal-Core”, my re-purposed 1963 Ford Falcon van that has been transformed into a mobile gallery space, with Chris Treggiari’s “Mobile Store”. I wanted to create a traveling art gallery pop-up and discovered the work Chris was developing which involved creating mobile structures mounted on trailer beds that went out into the community. Our ideas resonated well and it made sense to absorb the two structures into a much larger project. (P.F) Building these structures now is a collaborative process where Chris and I work together in developing a unique design for each event that responds to the specific circumstances we’re installing in as well as the concept and programming generated for each event. We have also brought in other artists, curators and architects for consultation in designing specific structures and developing certain concepts. (J.T) How did you and Chris Treggiari come together to work on this project? (P.F) I met Chris in 2009 while planning a mobile video exhibition I was curating and he contacted me about potentially collaborating. We discovered that we were both investigating similar ideas about community-based public artwork, mobile structures and developing a more collective way of curating exhibitions. Out of these concepts we came up with the idea for MAP. Hit it off great and have been working together ever since! (J.T) How do people interact with the platform? (P.F) It is our goal to inspire the passive viewer to become an active participant. We try to incorporate a number of different levels of participation that the public can engage in. By offering interactive projects we invite the viewer to roll up his/her sleeves and take part in an activity that results in the making of an object, while also having available video installations and static artworks by established and emerging artists. At many of these festivals we have commissioned instructors to teach a wide variety of thematic projects ranging from folding origami to creating custom aerosol stencils. It is great to see people who may have lived in the same community all of their lives and never met working together on something creative. (J.T) How much of the art/performance at these events is impromptu? What’s curated ahead of time? For example: the youth talent show at Potrero, was the talent for the show pulled right from the event, or was this set up ahead of time? (P.F) The basic participatory structures and activities are planned beforehand, but the actual artwork that is created within these parameters is quite impromptu and developed by the community participants themselves. We aim to create projects that are accessible to the public where a meaningful experience can happen even without any prior knowledge of art history. (P.F) In the case of the Potrero Festival we partnered with The ‘Nabe (Potrero Hill Neighborhood House) to create the overall theme of a talent show, and they outreached to people in the community who were interested in participating. At the event both the crowd response and the judges determined the winners. (J.T) What were some of the memorable experiences / community-created pieces you encountered at previous events? (P.F) In 2010-11 we have partnered with SOMArts to create a series of 5 “Pop-Up” exhibitions appearing at large SF street festivals and on-site at SOMArts, made possible though a generous grant from the Creative Work Fund. The August 14th event will be the culminating installation in this series. In July 2011 we had a fantastic experience installing a mobile stencil station at the Precita Eyes Urban Youth Festival in La Raza Park. In this piece we invited people to create a three layer stenciled poster of the SF skyline that was designed by local artist James Gregg. People loved the piece and it was amazing to see four year olds and eighty year olds from every imaginable background working side by side to spray paint in stencils! Another piece we featured at this event was a “Yes, We Can_____” positive picketing piece. We had pre-printed signs that we gave out to people to write in their message and carry the signs around the park. (J.T) What have the response from the community been like? (P.F) It has been great. Especially when people find themselves participating in a creative project they didn’t expect to encounter at a public festival. We also incorporate talent from within each community we set up a Map installation so there is a sense of neighborhood pride and community built into each manifestation. (J.T) What’s next for you and mobile art platforms/community centers? (P.F) We still have a few upcoming Map events in 2011. On September 1, 2011, we are partnering with the Bernal Heights Outdoor Cinema for the Tiffany Ave Block Party. It should be a really fun event with screenings by local filmmakers, music and interactive filmmaking projects happening on-site. In November 2011 we will have a MAP installation set up at the Oakland Art Murmur First Friday opening. In 2012 we plan to set up more MAP installations throughout the Bay Area, and we hope to take the project on the road to other cities along the West Coast.